Deck the halls? That's so last year. In 2008, resolve to let more sweetness in your life by decking the walls--and fridge, and your whole house or apartment for that matter---out in dessert-related finery. Not only will these ideas make everyday life a whole lot sweeter, but they're also calorie-free for the (*cough* nevergonnalast) resolution dieters out there. 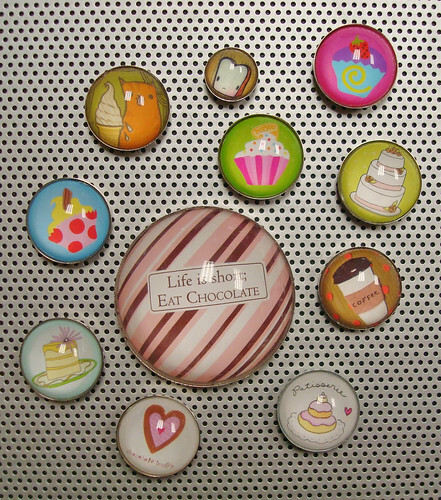 For your fridge: Cake and dessert related refrigerator magnets are like a preview of what's in the fridge! Our own Head Spy Jessie is the art director of this company (no, she doesn't get paid extra for putting them in here), so naturally there are a lot of cake related designs, including dessert-themed magnets by Julia Rothman, Stacey Asato and even Mrs. Cakespy herself. $11.50 for a set of 4 one-inch magnets, $6.50 for one "Big" magnet; various styles available online at ipopshop.com; cakes shown to the left currently only available by calling 800.638.9622. For your bedroom: You'll be guaranteed sweet dreams if you rest your little head on one of these pillows: cookie pillows by Pancake Dinner are perfect for naps or as throw pillows ($20; available online at thepaperdoll.net); for bigger appetites or a longer sleep, artist Bethany Schlegel does cozy, fluffy screen printed ice cream ones ($34 ea.). For the kitchen: While technically calorie-free in and of themselves, we will admit that these cupcake toppers by Bake+Destroy! are perhaps at their best when perched atop freshly baked little cupcakes. Call us diet-saboteurs if you will; call us enablers...both very true. But seriously, how could you resist these toppers, available in styles like Holy Elvis (left), Shark Attack, Gnomes and more? $6 ea., or $3 for a DIY kit. We'd say that 2008 is going to be one sweet year. 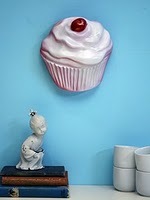 For more information or to pass on more awesome ways to deck your home out in sweetness, please email us!